This is a review of the online backup company, SOS Online Backup. The firm has been in business since 2001, and has 11 data centers located in North America, Europe, and Asia. The presently service millions of clients all over the world, and that number is growing every day. They have won a few awards, which were the PC Magazine’s Editor’s Choice Award and Laptop Magazine’s Editor’s Choice. In addition, Inc. Magazine, LAPTOP Magazine, the New York Times have written articles about the company. Each and every day, more and more people and businesses are coming to understand that the utilization of an online backup company is no longer an option, but a necessity. Simply put, the service that they provide cannot be done as securely, as any onsite alternative. In addition, the capital outlay to be fully protected is far less that it would be, if you tried to do it yourself. An online backup company supplies you the highly sophisticated software, and extremely powerful servers, that are required to backup virtually any size of company’s most important data. If this happens to be the first time that you have researched the online backup industry, we invite you to read all of our reviews, so that you can fully educate yourself on the different features that each company provides. Now that all the preliminary is finished, on to the review for the online backup firm SOS Online Backup. Allows their customers to back up five computers with one account. Only offers PC backup solutions, does not support MAC or Linux. Plans are limited to 50GB-100GB storage space. This limitation negates the 5-PC feature. 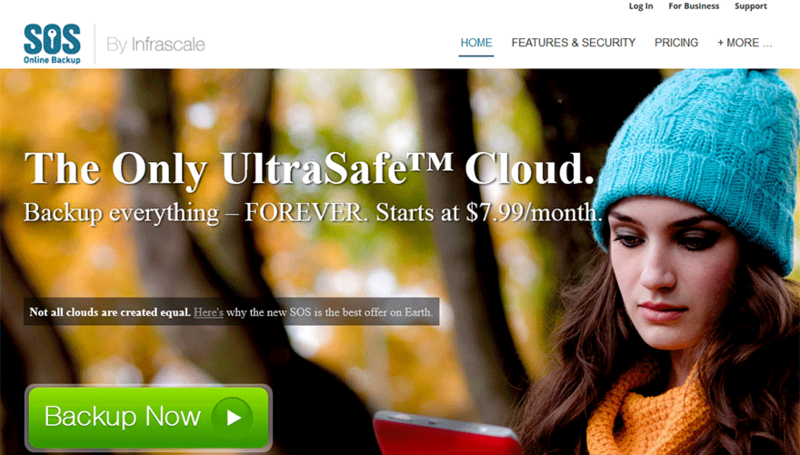 The online backup company SOS Online Backup has two pricing plans, one for the home use, and one for businesses. We have to mention one special feature that this company provides, that we have not found supplied by another firm in the online backup industry. Which is, they make available to their clients FREE expert instillation of their software system. We like this proposition quite a bit, and if you do signup to use their services, we strongly advise you to take advantage of this very gracious offer. Their home based services start at $79.95 a year for 50GB of storage space, and drops to a little bit less than $52 a year, if you pay for 3 years in advance. If you need more capacity, you can get 100GB of backup space for $9.95 a month, $99.95 for a year, $149.95 for 2 years, or $199.95 for 3 years, if you pay the entire amount when you first signup. SOS Online Backup business packages are structured as follows. Their first level provides 10GB of space, and it runs between $80 a year to $120 a year, depending on how many years you pay for upfront. For 25GB, you will pay between $200 to $300 a year, once again, depending on what option you select. If you need 50GB, it will run your firm between $400 to $600 a year, which of course is based on how many years you pay in advance. 250GB will cost you $670 to $1,000 a year. If you need more than 250GB, just give them a call and let them know your estimated usage, and they will provide you a quote. The online backup company SOS Online Backup provides chat support, Monday thru Friday 24 hours a day. They also have all kinds of text and video tutorials that are very well thought out and extremely easy to understand. We really wished that they also had a telephone support system. But, since they do install their software on your computer for free and make sure that it is operating correctly, this is not nearly as big of a deal as it would be with other firms that do not provide this service. We were no dummies when it came to getting the online backup firm SOS Online Backup software installed, we just let them do it for us. It really is a fantastic service, and one that puts them head and shoulders above the competition. To learn how to operate it, and to make sure everything is getting saved properly, all we did was watch their video tutorials. They taught us everything that we needed to know, and the entire process could not of gone any smoother. If you are a computer novice, or you posses very little computer expertise, there is no debating the fact, that this company is an absolute dream to work with, and the one that you should select. You can use the online backup companies SOS Online Backup servers if your systems meet the following requirements. Just like every other online backup company, on SOS Online Backup servers you can store just about anything that you want. This includes, videos, music, software, pictures, emails, text, software, or anything else that is not mentioned that is legal to own. Here it goes, our final rating for this review of the online backup firm, SOS Online Backup. SOS Online Backup is a good online backup service but we wish they offered other operating system support besides just Microsoft OS. SOS Online Backup is pretty expensive but that being said, they are a little expensive, but then again, you get what you pay for. It is not cheap to operate an online backup company if you make sure that you do everything absolutely the right way, and SOS Online Backup does. If you want to go with one of the very best firms in this industry, that has a ton of safeguards and other systems in place that most other companies do not wish to spend their capital on, then you certainly should strongly consider SOS Online Backup.